Andreas Hinkkala and I (Henrik Hinkkala) climbed Crystal Chandelier on Mount Arrowsmith. Conditions were warm, around 0C. Ice was in decent condition, and took on average 16cm screws. Also the Weepy Wall near the Saddle approach is fat. Dec. 3 – Ben Hamilton and I (Jeremy Thom) went back to Cal Cheak. 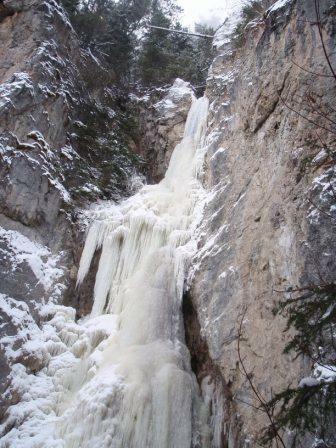 It’s melting pretty fast, but there was still plenty of ice for 13 – 16 cm screws all across the wall. The top of the WI3 flow is pretty much all snow covered drytooling/scrambling now and a bit runout above the last (dicey) screw, but it’s easy. 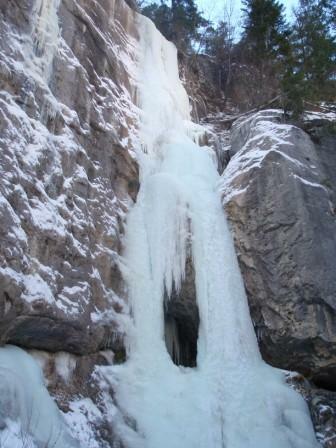 Dec. 4 – Marc-Andre Leclerc, Craig Beaumier and I (Jeremy) hiked up to White Blotter. It’s fat and blue, though seemed pretty chandeliered and cauliflowered (which I gather is its charm…). We were too scared to get close enough to inspect it in detail though – the sun hit it about 11 and it quickly became a warzone of falling ice throughout the entire amphitheatre. Icicles and daggers everywhere. There is a fracture line near the top of the initial pillar, but it seemed pretty well healed. It’s filled in all the way to the top, though the top pitch looks very delicate and technical. On a cold cloudy day, early in the morning, it’d probably be beautiful. After bailing, we hiked up to and climbed the first pitch of The Plum. Compared to last Sunday, it was thinner and the holes with running water were bigger, but the surface of the ice was dry this time and there was plenty of great solid thick ice for screws. 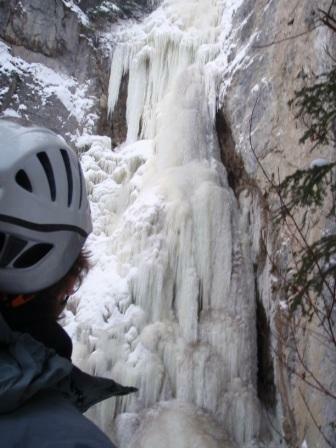 The top of the first pitch requires traversing over some disconcertingly hollow sounding ice, with lots of water running underneath. Poole View Falls looked pretty discontinuous and sun rotted already. Entropy still looked all there, but it was covered in snow so it was hard to assess. The Green River climbs (Blue Moon on Rye, etc) looked very melted and discontinuous. On December 4, 2010, Matthias Ruh and I (Don Montrichard) drove up to Oregon Jack. From the base the route appeared to be ready to climb. 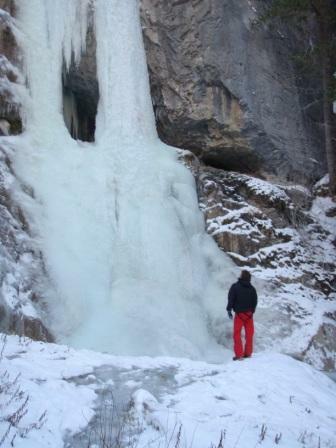 However, we ended up backing off after we both took a look at the quality of the ice above the first 15 metres – it became apparent that the ice above was thin and hollow, with a lot a water running behind it. We stopped in at Marble Canyon. 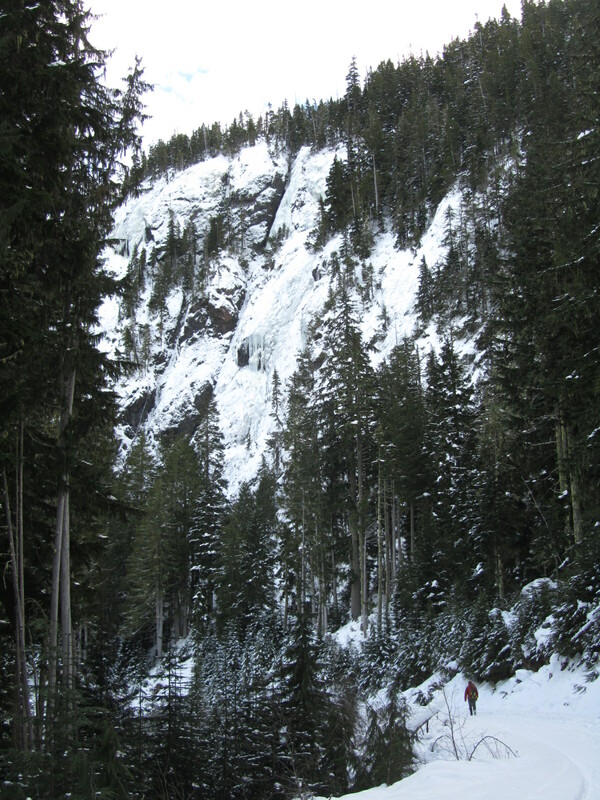 The left side of Icy BC was very wet. 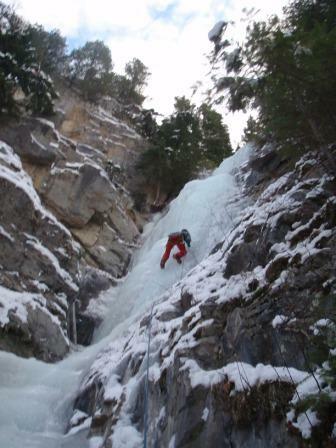 We tried to climb the right side, but determined that we did not trust the ice to hold any pro. We held a quick toproping session instead. 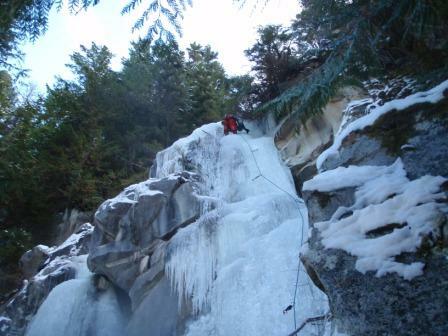 On December 5, 2010, we climbed Rambles Centre. 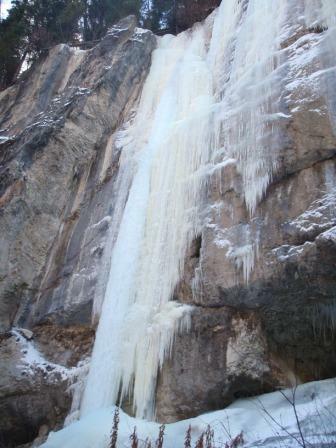 The ice in here was great, and we were able to climb three steps of continuous ice up to WI4-. Wow, that sure looks challenging! Great work guys! I have trouble climbing a flight of stairs let alone a treacherous 12 to 24 foot high blocks of ice. You should get a bumper sticker to commemorate the climb.